ISLAMABAD, Sept 26 (APP): Minister for Information, Broadcasting and National Heritage Senator Pervaiz Rashid said on Monday right to information (RTI) law was as necessary for the people as that of electing a government through vote. Addressing the award distribution ceremony for Right to Information Champions hosted by Coalition of Right to Information (CRTI), here at National Press Club, he said the draft of RTI law would soon be presented in the federal cabinet for its approval and then tabled in the parliament for making it an act. Implementation of the bill, he said, would be celebrated in a befitting manner. He said the people’s access to information would help ensure rule of law, merit and justice in the country, besides improving the performance of national institutions. Pervaiz Rashid said it was the Pakistan Muslim League-Nawaz (PML-N) government of the Punjab province which adopted the RTI law in 2013 in its previous tenure. If the PML-N was against the RTI law then its government in Punjab would not have adopted it, he added. He said there was no justification in hiding information from the people. The minister said his ministry had sent the draft of the RTI bill to the Ministry of Law and Justice for its legal diction without making any changes in the spirit of the bill. He said last month he chaired five meetings in which legal diction of the bill was discussed. The bill had been prepared in a way that no one could misuse it for stopping the flow of information, he added. He said the credit of the bill’s approval would go to the entire parliament, the Senate Committee on Information, Broadcasting and the people of Pakistan, who had been struggling for democracy, freedom and press and political liberties. Local journalist Aizaz Syed and a resident of Lahore Sarmad Ali were given Champions of CRTI awards. Later, the minister said PTI Chairman Imran Khan should ensure that justice was provided to the sacked officer of the Khyber Pakhtunkhwa education department Azra Afridi who blew the whistle against corruption in her department. Imran Khan should take it a test case as it provided him a golden opportunity to prove his lectures of justice and accountability, which he delivered every day, he added. 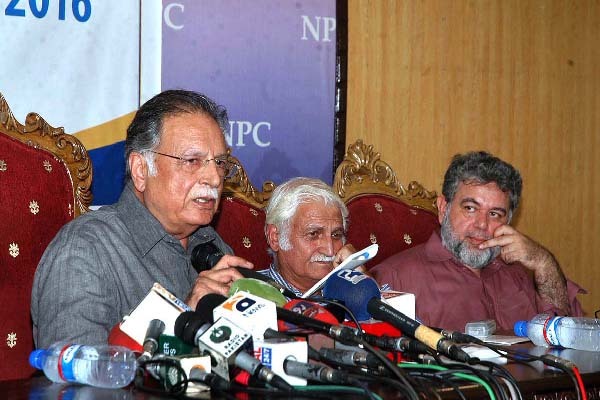 Pervaiz Rashid said the people had stopped believing in Imran’s claims about accountability and justice. They had realized that all his speeches were meant to get political mileage. However, if he provided justice to the lady the people might start believing in him again, he added. Speaking on the occasion, Azra Afridi said she was dismissed from service by the KP government when she pointed out embezzlement of funds in the provincial education department. She approached the Pakistan Tehreek-i-Insaf (PTI) chief hoping that he would help provide her justice, but he left her at the mercy of the KP government which not only dismissed her from service but got also registered fake cases against her family, she added.